After nearly a year of negotiations, Garbo agreed to renew her contract with MGM on the condition she would star in Queen Christina and her salary would be increased to $300,000 per film. 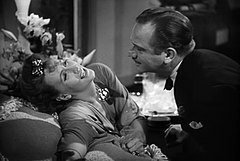 The film's screenplay had been written by Viertel, and although MGM had been reluctant to make the movie, they relented at Garbo's insistence. For her leading man, MGM suggested Charles Boyer or Laurence Olivier, but Garbo rejected both, preferring her former co-star and lover, John Gilbert. 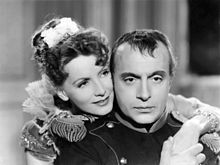 The studio balked at the idea of casting Gilbert, fearing his declining popularity would hurt the film's profits, but Garbo prevailed.Queen Christina was a lavish production, becoming one of the studio's biggest productions at the time. Publicized as "Garbo returns", the film premiered in December 1933 to critical acclaim and box office triumph and became the highest-grossing film of the year. 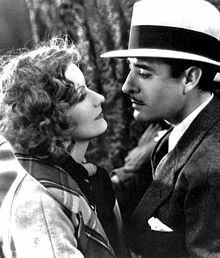 The movie, however, met with controversy upon its release; censors objected to the scenes in which Garbo disguised herself as a man and kissed a female co-star. ^ Reif, Rita (19 July 1990). "Garbo's Collection and a van Gogh Are to Be Sold". The New York Times. Retrieved 11 October 2015. Bainbridge, John (10 January 1955). "The Great Garbo". Life. Retrieved 22 July 2010. Bainbridge, John (17 January 1955). 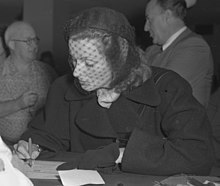 "The Great Garbo: Part Two: Greta's Haunted Path to Stardom". Life. Retrieved 22 July 2010. Bainbridge, John (24 January 1955). 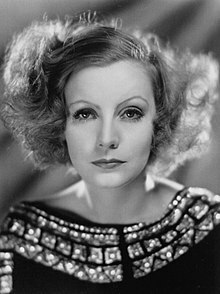 "The Great Garbo: Part Three: The Braveness to Be Herself". Life. Retrieved 22 July 2010. Biery, Ruth (April 1928). "The Story of Greta Garbo As Told By her to Ruth Biery, Chapter I". Photoplay. Retrieved 22 July 2010. Biery, Ruth (May 1928). "The Story of Greta Garbo As Told By her to Ruth Biery, Chapter II". Photoplay. Retrieved 22 July 2010. Biery, Ruth (June 1928). "The Story of Greta Garbo As Told By her to Ruth Biery, Chapter III". Photoplay. Retrieved 22 July 2010.